Coral Gables is a community built on a grand scale that blends color, detail, and the Mediterranean Revival architectural style. 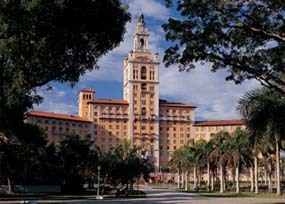 The City is located in Miami-Dade County, just 2 miles from Miami International Airport. Our 26-page Coral Gables Web Guide is designed to help you research the City to find the travel information you want with a minimum of frustration. To get started, use the navigation table below. Search Google for "Coral Gables City Guide"